Embassy Gallery is worthy its name as Edinburgh’s most avant-garde art space. 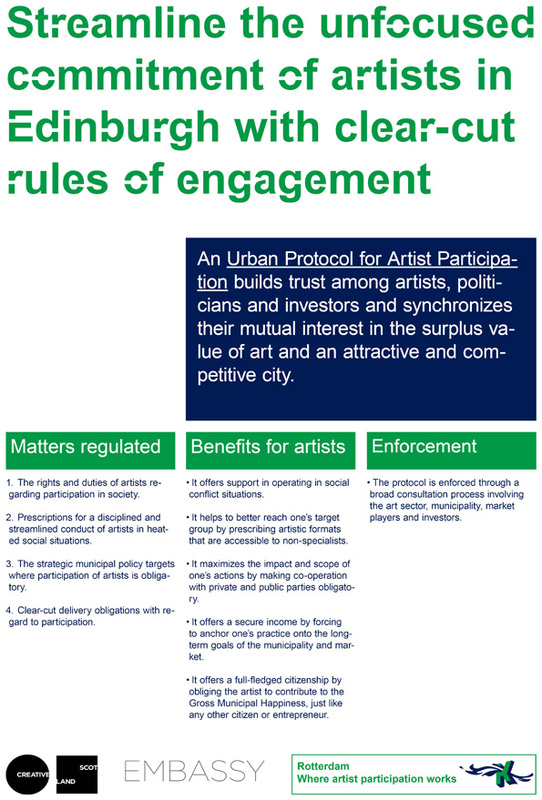 Embassy Gallery takes the lead in the city’s offensive towards artist participation. In its Going Public programme the gallery organizes information and work sessions with Edinburgh’s most important local stakeholders including both artists, representatives of Edinburgh’s main art institutions as well as policy makers. Gideon Boie and Matthias Pauwels, spokespersons of the Office for Artist Participation, share their experiences in implementing the cultural policy guidelines in Rotterdam. The Embassy Gallery sets up video conferences in which they invite questions and discussion around their proposals. 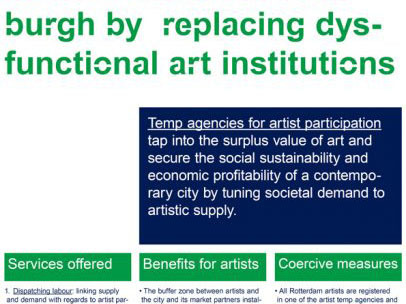 The goal is to creatively adapt the Rotterdam roadmap towards artist participation into the specific, local character of Edinburgh’s art scene. In this way, opponents will not be able to discard the participation policies as a merely foreign, European import product. This will help to put artists back to work for Edinburgh’s big come-back on the map of thriving global cities. The Office for Artist Participation is founded in 2010 as a special task force aiming at the accelerated implementation of Rotterdam’s cultural participation policy for the period 2009-2012. 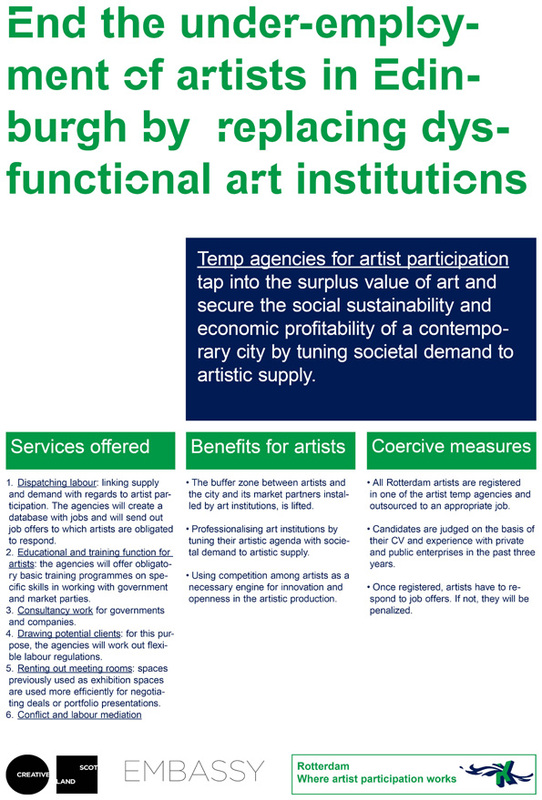 It is supported by the Department of Arts and Culture, the Rotterdam Centre for Visual Arts and The Netherlands Foundation for Visual Arts, Design and Architecture. The cultural mediation firm BAVO acts as spokesperson of the joint venture.